The Rocky Mountain Writing Centers Association (RMWCA) is the regional chapter of the International Writing Centers Association for the states Arizona, Colorado, Idaho, Montana, Nevada, New Mexico, Utah, and Wyoming. This regional network acts as a support and resource for administrators and tutors and gathers at the Rocky Mountain Writing Centers Conference to celebrate and learn from those who tutor writing. The Rocky Mountain Writing Centers Association provides support, encourages scholarship, and promotes community among writing center professionals working in educational settings. Our primary commitment is to serve writing tutoring programs in our region while inviting participation from colleagues nationally and internationally. We define writing centers broadly, acknowledging the intersections of writing, reading, and academic support in the various institutional settings in which this work occurs. The organization is organized exclusively for educational purposes under section 501(c)(3) of the Internal Revenue Code. Association membership includes directors, staff, tutors, and those associated with writing tutoring programs at all levels of public and private education within all or parts of the states of Arizona, Idaho, Nevada, New Mexico, Utah, Colorado, Montana, and Wyoming. Voting members include those who pay individual membership dues or representatives of members whose programs pay institutional dues. Jamaica Ritcher, RMWCA Outreach Coordinator explained the purpose of the Summer Book Club: "It's not uncommon for writing center administrators to feel somewhat isolated within their larger institutions, perhaps especially so during the quiet summer months. The Summer Book Club is proving to be an easy and really enjoyable way for us to stay connected with each other and with the latest in writing center scholarship." 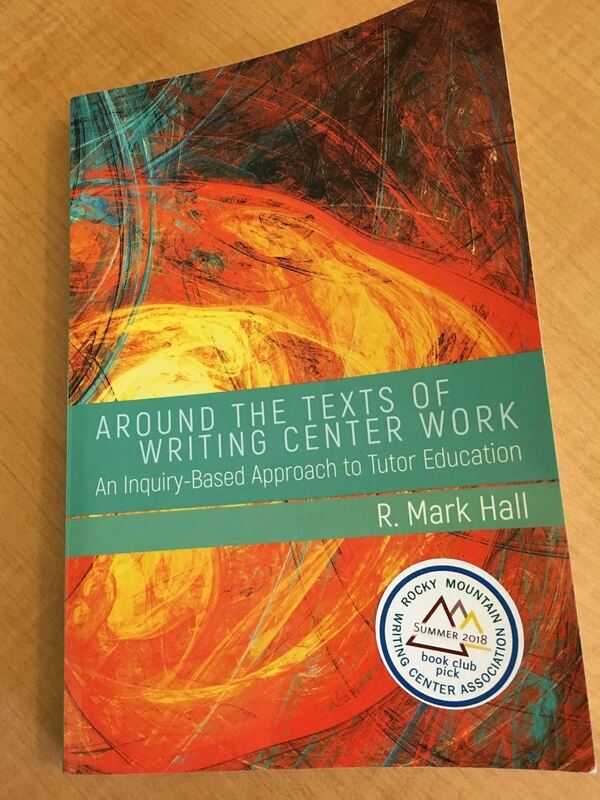 The RMWCA Summer Book Club began in 2018 with a discussion of R. Mark Hall’s Around the Texts of Writing Center Work. RMWCA members gathered online to discuss the book during the summer of 2018, culminating with a session with Mark Hall to discuss the work. Dr. Greenfield will also be taking part in the culminating session for 2019, where she will discuss the book with Summer Book Club participants. Gardner hopes to expand the number of discussions in 2019, but notes that RMWCA has not finalized the schedule yet. The final schedule will be determined shortly, and will be found at www.rmwca.org. Dr. Laura Greenfield, (Ph.D. in English from Washington University in St. Louis) is the founding Director of the Transformative Speaking Program and Faculty Associate at Hampshire College in Amherst, Massachusetts. According to her Hampshire College website, Dr. Greenfield’s “research and teaching interests include speaking and writing program administration, with a particular focus on social justice frameworks; critical pedagogy and anti-oppression education, with a particular focus on race and gender; public speaking, composition, and rhetoric; sociolinguistics, with a particular focus on ESOL and racially stigmatized language use in the United States; and contemporary multicultural American literatures, with a particular focus on ‘hybrid’ or borderland identities.” Dr. Greenfield’s previous publications include International Writing Centers Association Outstanding Book Award winning Writing Centers and the Racism: A Call for Sustainable Dialogue and Change--co-edited with R. Karen Rowan (USU Press, 2011). RMWCA is a regional chapter (covering Arizona, Colorado, Idaho, Montana, Nevada, New Mexico, Utah & Wyoming ) of the International Writing Centers Association. This regional network acts as a support and resource for administrators and tutors and gathers at the Rocky Mountain Writing Centers Conference to celebrate and learn from those who tutor writing. More information about RMWCA and the Summer Book Club may be found at www.rmwca.org. Jessica McDermott of has been duly elected as Colorado State Board Representative. The Rocky Mountain Writing Centers Association (RMWCA) is proud to announce the results of the 2018 elections. Lisa Bell will serve as President Elect for two years, and then move into the role of President for the subsequent two years. She will serve alongside Clint Gardner as President/Past President. Kelley Webster, has been excused from her duties as Past President due to her demanding new position at the University of Montana. The following positions will serve until 2020. Jamaica Ritcher has been re-elected as Outreach Coordinator. Aubrey Julianna Baucum will be the new Tutor Representative. Matt Drollette takes on the role of IWCA Affiliate Representative. Jess Carroll will be our new Secretary. Heather Graham will serve as web editor until 2021. State Representatives serve two year terms, and work closely with the Outreach Coordinator. They are, Arizona: Nick Cenegy; Montana: Erin Strickland; Nevada: Rachel Herzl-Betz; New Mexico: Katie Denton; and Utah: Michelle Szetela. RMWCA is still seeking State Representatives from Colorado and Idaho. If you are interested in running for those positions, contact Clint.Gardner@slcc.edu. The Editor for Utah State University’s academic Journal on Empowering Teaching Excellence (JETE), Kim Hales, invites RMWCA members to submit articles for review. JETE publishes twice a year: https://digitalcommons.usu.edu/jete/ . When the Writing Center at Salish Kootenai College (SKC) opened in January of 2009, it was the first writing center on a tribal college campus. SKC is on the Flathead Indian Reservation in northwest Montana. About 75% of our 800-member student body is Native American, and they represent 70 different tribes. In addition to our vocational programs and nearly 20 associate degree programs, SKC offers 15 different baccalaureate degrees. Though our writing center works closely with our liberal arts department, we serve students from all these programs. Until this year, our facility was almost entirely a peer-tutoring program. The director is a faculty member who also does tutoring, but all other tutors have been students. Student tutors are generally recommended by instructors and then apply for a tutoring position. Before they are hired, they complete a full quarter of training, which includes a class focused on tutoring techniques and philosophy as well as a minimum of 20 hours of volunteer tutoring (initially supervised by the director or more experienced tutors as needed). This both prepares tutors to help their fellow students and also allows them to earn their Level One tutoring certification through the College Reading and Learning Association (CRLA). SKC is certified to train and certify their tutors through all three CRLA levels. This approach has been really effective in preparing high quality tutors. Many tutors complete all three certification levels and after working in the writing center for a few quarters are competent to work as TAs in writing classes. Our tutors also often receive requests to prepare and conduct presentations or lead writing workshops in classes. Another component of our tutoring program is our tutorial classes, which are offered in conjunction with both levels of composition. These are meant as an additional support for students whose placement tests indicate they are on the border between English 101 or a remedial writing class. Our tutors also teach these weekly supplemental classes. The number of tutors working in the writing center has varied from three to ten since our staff is largely dependent on tutors’ credit loads and class schedules. They all work less than 20 hours a week. This fall we have also had two additional part-time tutors, who are staff rather than students. Their salaries are currently grant-funded, but if we are able to add a permanent position or two (in addition to the director) it’d be really helpful to address our most difficult staffing problem: tutor retention. Our best tutors are always gone after a few years because they graduate. Our approach to staffing is one of many aspects of our writing center that has been constantly evolving and transitioning since we opened. Though our vision has remained consistent, we’ve had four different directors and are in our second (temporary) space, while plans for a permanent home are underway. The demographics of our student body are also changing. Although we’ve traditionally had a very non-traditional population, with students in various stages of life with widely varied academic backgrounds, we’re attracting more and more students right out of high school as our academic offerings (and on-campus housing and student activities and the like) continue to expand. So far, through one-on-one tutoring our writing center has been directly serving about a fifth of the student body each year, but we hope to reach more as our space and staff increase. Those who do use our services usually come back frequently. Our writing center is filling an important need for both our writers who struggle and our top students who want to ensure their academic work is the best it can be. We’re excited to continue to grow to serve our student population. The Writing Center at Casper College in Casper, Wyoming, has a new home in the old college bookstore. Co-directors Karen Moenkhaus and Darby Sawyer were given the opportunity to design and furnish our new digs. We chose a color scheme of navy blue and lime green. Because this is a large space, we had the freedom to be creative and used artwork from our Visual Arts Department. The entry way has an appealing sitting lounge area with couches, chairs, and tables. Book shelves separate off the tutoring area with five spacious areas for individual or group tutoring sessions. presentations and receive feedback. We even have a classroom that is perfect for English classes and for other instructors to bring students in for workshops on writing. Our tutors and students feel at home in our new area. We write on the heels of a productive conference season and during a time of transition for RMWCA. We hope you’re enjoying the turn toward spring and the renewal this turn promises. For the RMWCA, this spring and summer mark exciting changes on the horizon. In an effort to focus on the value RMWCA can bring to you, we’ve been building a new website that will serve as a gathering ground for our information sharing, resources, and tutor interaction. We’ve launched our first webinar this spring, which was impressively successful, and we’re planning for more. Our peers at the University of Utah and our Colorado/Wyoming colleagues hosted two excellent conferences. We are an active region! To help us maintain this momentum and build toward more robust benefits for our members, this July we will implement our new and affordable tiered dues structure. The membership dues will allow for both individual and writing center memberships, ensuring our organization remains affordable and accessible. We are very excited about the membership benefits these dues will help to fund, including travel grants and RMWCA Tutor Conference registration discounts. Please watch for further communications as we begin collecting dues this summer. Finally, we write to announce one more coming change: a transition of leadership. Kelly Webster’s time as RMWCA President will come to a close as she transitions to a new leadership role at the University of Montana. Our great fortune is that Clint Gardner will take the helm. We are confident Clint will help us realize the benefits of our recent efforts. Clint is the right leader at the right time, especially as we aim to develop new opportunities for membership engagement. We’re on our way. Please don’t forget to share your good news, questions, and announcements on our list serve rmwca@uidaho.edu . Happy Spring, everyone!